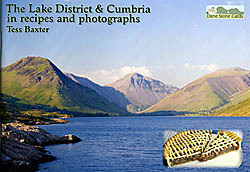 A photographic tour of Cumbria and the Lake District, spiced with local and traditional recipes. The book has grown out of the Dane Stone Cards range of recipe postcards. There is a wealth of information on the recipes and the history of Cumbria and the Lake District. Wordsworth, Beatrix Potter, the West Indian spice trade and the Roman Empire are just some of the areas explored. Format : Paperback;168 x 240mm.